Here’s the VOST Basics presentation Caroline Milligan (@mm4marketing) and I built for introducing new folks to the VOST concept. It’s up on Slideshare for all to use to introduce the VOST concept to their own agencies and organizations. Will post more about this here soon. Enjoy. I’m one of several VOST members assisting in the development of many new VOST teams this year. As new teams are gear up for wildfire and other possible activations, I thought it would be helpful to discuss the tools and resources that we’ve used from the point of view of the specific needs instead of based on the tool, app or services. So below is a list of VOST needs, the purpose or reason behind each need, what resources we’ve used previously to meet that need, and what we plan on using soon. Each VOST team and activation may create new needs and other VOSTs may already be trying out new things; in other words “your mileage may vary”, but hopefully this post and the graphic I built to identify the “backchannel” or non-public resources as opposed to the public-facing resources will be helpful. Note that some resources are used both for backchannel and for public sharing. 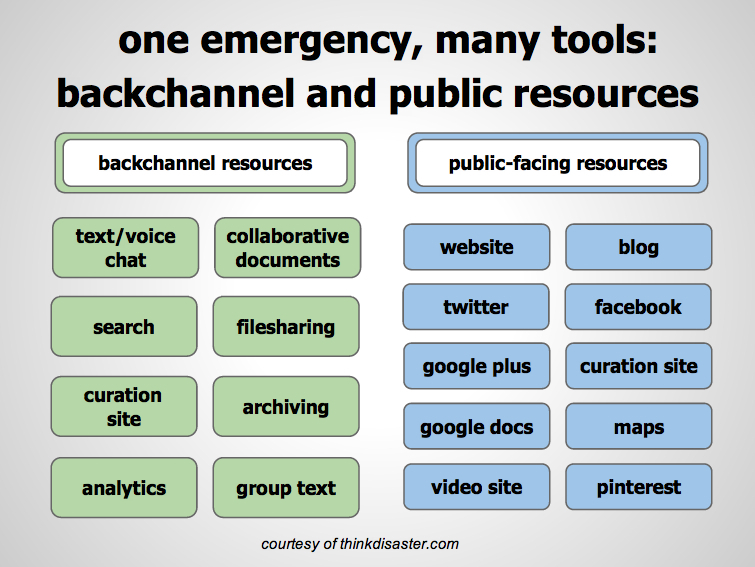 Our plans are to build our backchannel resources, then build activation-specific public-facing resources. This is because, as we learned on the Shadow Lake fire activation, we want to make it clear from the start what incident the team is supporting. This can be done by choosing an instance-specific name and using that name for all public-facing tools. Also note that we are working on developing backup resources for all needs – If you’re building a team, be sure and include backup resources for all needs in your plans and exercises. Sometimes these resources and services go down temporarily, so be ready for that. Purpose: Alert team as quickly as possible to an activation or possible activation. SMS group text messages, individual text messages, or twitter DM messages have been used previously to activate the team or ask them to gather for a discussion. Purpose: ‘Offline’ discussions needed to set tasks, clarify issues happening in real time on social media platforms, or other things that don’t need to be discussed in public. Many teams have ongoing regular conversations between activations to keep in touch and discuss new resources, tools and developments. This helps to get people comfortable with each other and the tools/services to be used. NOTE: There are other backchannel comms tools that meet specialty needs, such as voice chat while driving via HeyTell or Zello apps. Purpose: Sharing documents, images and anything that the team may find useful to meet its objectives. Purpose: Save all useful info such as websites, articles, social media posts, tweets, status updates quickly and easily to one “stream” or place – may be useful to have one for public use and one for private VOST use; public curationsite for providing an ongoing narrative to the event, private curation site to provide context that will help the team keep updated on critical issues. Purpose: Share live stream of meetings, or videos of events. Purpose: Archiving and for use during activation. Purpose: To be able to analyze crisidata for future study and improvement. • Tools proposed: TweetReach, Google Analytics, ? Note: Public -facing resources include instance-specific twitter, facebook and other standard social media platforms. Find out what platforms are use most in the area near the disaster and be there.